Anyway. his distinctive art, weird manga choices, and wild sense of humor made him something like a cult favorite artist, so I was shocked to see Sesuji wo Pin! to, a new series in Weekly Shounen Jump (the most well-known manga publication in the world) from a familiar name. What was even stranger: it’s a completely innocent, adorable and passionate dance manga, as opposed to the, uh…rather lewd and raunchy manga he’d worked on before. 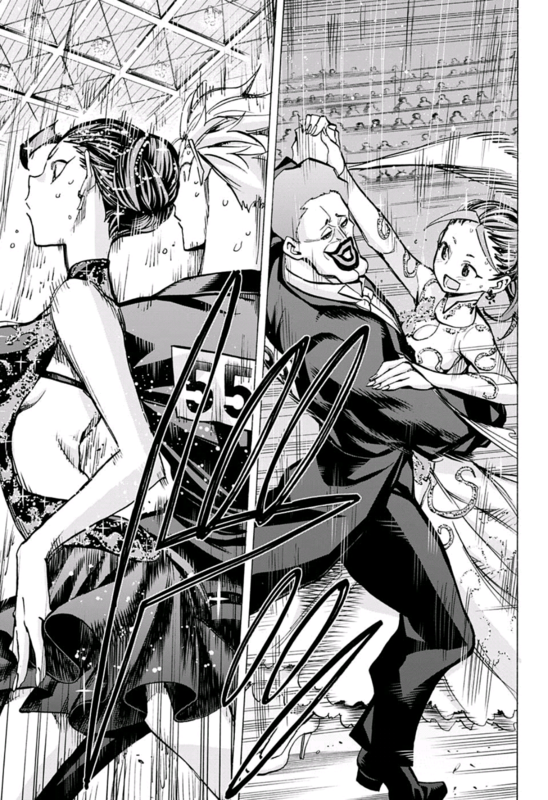 I can only think of one other dancing manga that people actually talk about and seem to like and that is Ballroom e Youkoso (while another that’s not so known, although I like it, would be this ballet manga called Kenrantaru Grande Scène). To be honest, I didn’t go in with high expectations. This was a solo work from an artist best known for working with other writers, and it featured a subject I didn’t particularly care about. I was also worried about conveying a sport that requires music and a lot of motion in manga form — I figured it wouldn’t work. 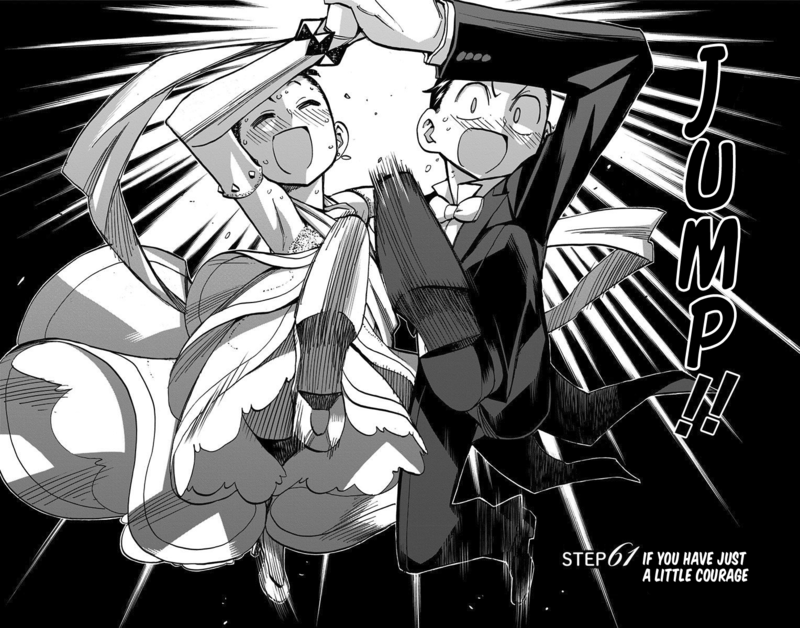 I will say now, after catching up with volume 8 (the latest as of this writing), the dances work splendidly, and this has turned out to be one of my favorites. It’s basically an unusual sports/”life” series with a lot of cute stuff in it and an emphasis on realism. Actually, it reminds me a lot of O/A in how it handles the sport and the people who participate in it, and that is a very good thing. 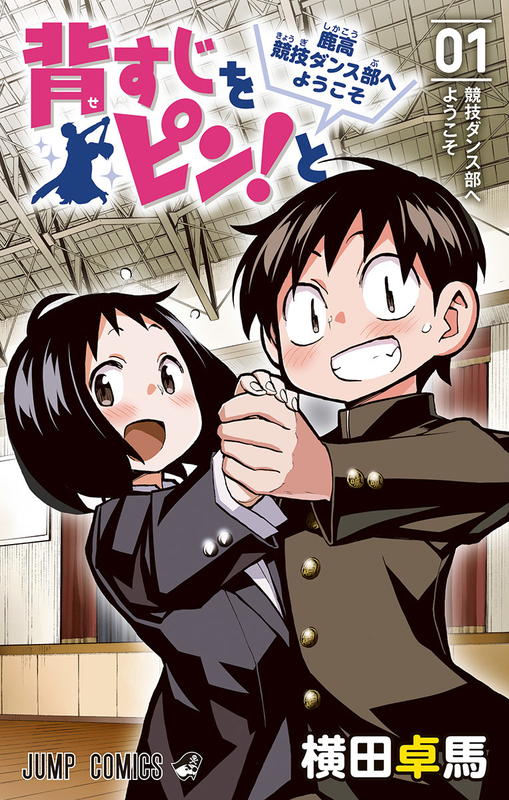 This series is about Tsuchiya Masaharu and Watari Eri, a pair of incredibly shy, unconfident, tiny and awkward first year students at Rokumeikan High School. After seeing a strong dancing performance from second years at the start of the year, the two of them find an interest in the sport. Crazy outfits! Intensity! Confidence! All of these things await should you join the school’s dance club (called dancesport, or competition dancing)! 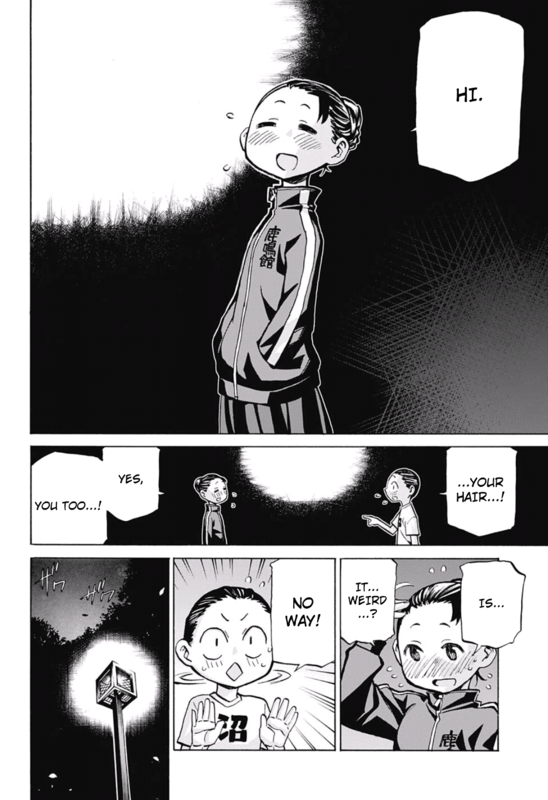 The two of them basically meet during the club signup trial period and discover that they have a mutual growing passion for this sport after having a lot of fun in the first practices (and taking interest in one another). By the way, Watari is incredibly cute. Before anything else, the hero and heroine of this series are great if only because of how nonstandard they are. Shy characters like the two of them tend to firmly stay shy and don’t make great efforts to change until later on, but the end goal of these two is to have fun and improve. Watari is also not what I’d call “beautiful”, and is instead rather plain. I just like to see that once in a while, since realistically a lot of people aren’t GORGEOUS. She really is cute, though, and I like her character trait of *sweat* *sweat* coming from her head most of the time. Oh! And how she’ll tug at Tsucchi’s shirt to get his attention! SO! CUUUUUTE!! You see, due to their small builds, while slower dancing throws them off, a fast dance like Quick Step…! Okay, getting ahead of myself. Anyway, these two are a lovely pair of goofballs and are a definite draw of the series. So, remember how I said there’s an emphasis on realism in this series? I swear, there is, but there are some rather cartoonish aspects, specifically in design rather than anything else. A few of the characters in this series just look completely ridiculous, and while other characters are aware they’re ridiculous, that lampshade doesn’t really dilute their strangeness. This fellow is Doigaki Masumi, the senior president of the Shika High dance club and the most outlandish design in the series. Basically, Doigaki is, in his design (and way of talking), a stereotypical gay Japanese flamboyant transvestite. That said, he is not gay nor is he a transvestite (just grew up with 5 older sisters) — instead, he’s basically the most far gone metrosexual I’ve ever seen in fiction or otherwise. I won’t lie, I consider him a hurdle for new readers. He certainly was a hurdle for me. He’s got ridiculous lips, ridiculous posture, a ridiculous outfit, and an absurd afro, after all. That said, he’s one of my favorite characters, so trust me: you just have to roll with it. I am still not entirely sold on his design or base concept, but Doigaki is a fantastic character. He’s like, surprisingly a hardass who is less honest with himself than you’d expect. 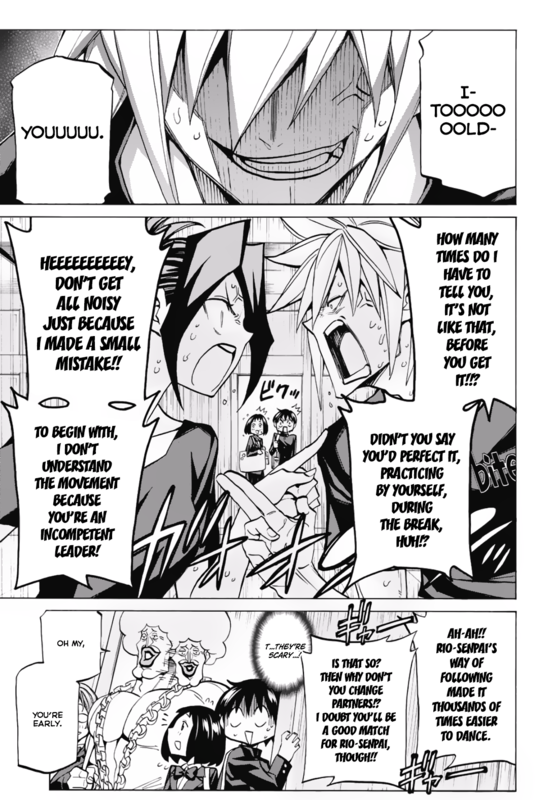 His relationship with his dance partner and other senior of the club, Ayatsujji Rio, is without a doubt my favorite thing from the manga so far and what pushed the series into my “favorites” category once and for all. It made me teary eyed and made me cheer. Doigaki is a very serious character in spite of his joke-character looks, and even his looks improve when he’s dancing for real. I won’t spoil the exact details of his “arc” with his partner, I’ll just say that it’s a very slow build (hints of it are there from about the start) and has a fantastic climax. It’s what really reminded me of O/A (the serious parts of it, that is). With that out of the way, check out those other two dancers up there. 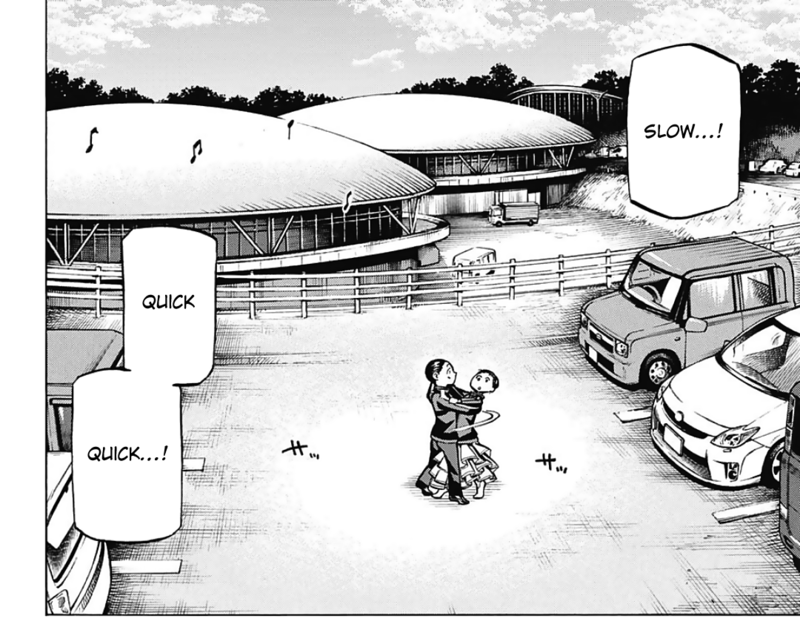 Yes, the manga references real songs — sometimes by name. 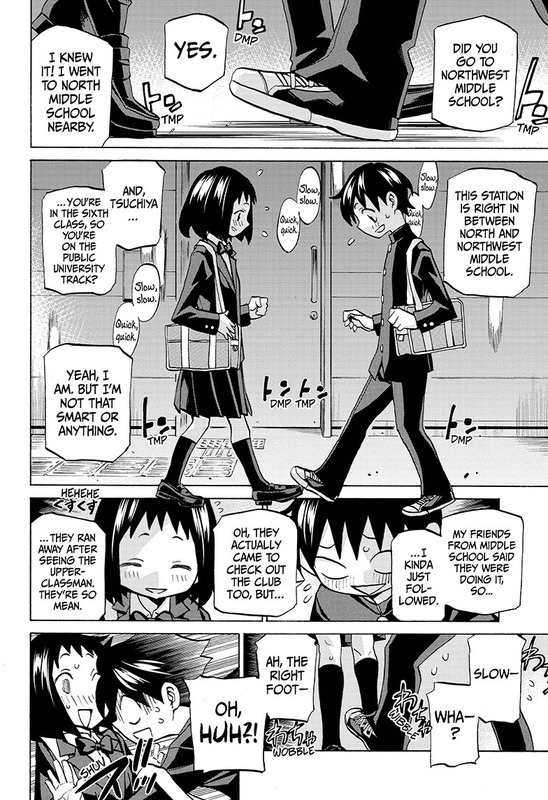 I guess this is one way the manga format is better…no licensing issues. Try playing the songs while you read! Anyway, these two are Yamaki Shou and Tsubaki Akiko, second years at the school’s dance club. They have a great relationship. Shou and Akiko go to show that although there are subtle romantic tones to the Watari/Tsucchi pair and the Doigaki/Rio pair, a pair != romance. You may be compelled to assume every pair of dancing partners is romantically involved, but this is a sport first so cut that out (for the most part, at least). 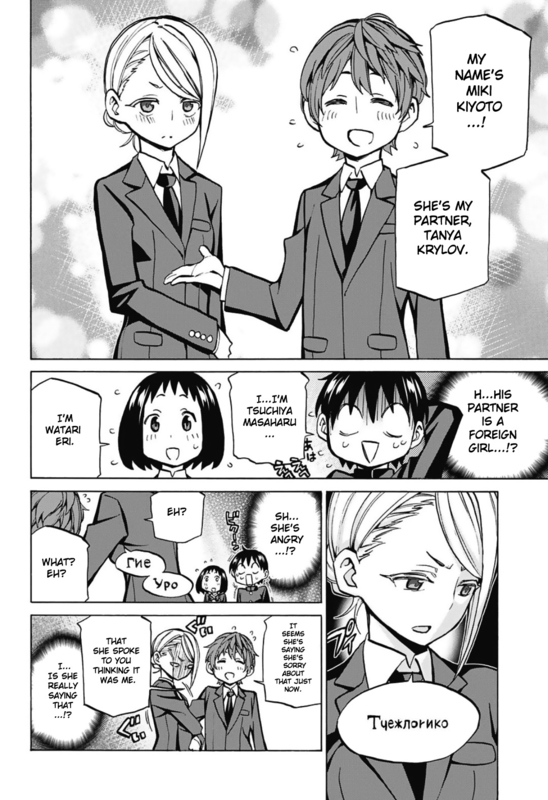 Shou and Akiko are exemplary of that. They legitimately do not actually get along. They can be friendly, but they are actually at one another’s throats an awful lot, and not at all in a playful way or one that makes it clear they’re close. They’re basically a pair of prodigies that began dancing in their first year and improved dramatically, but only paired with one another due to physical compatibility and pure practicality (there were no other members to pair with). Shou is a ladykiller sort with a big ego and fat ambitions, while Akiko is a firecracker with roughly equal ego and ambitions. I think it’ll be most interesting seeing how these two develop, because although they’re splendid dancers their actual teamwork is lousy. By the way, it’s super weird how you can tell a sharp difference between the characters the main artist drew and the extras his assistants drew… Just a note. Anyway, characters tend to mainly develop while out on the dance floor, blending thought and narration and implied communication between partners with flashbacks and beautiful scenes to paint a powerful canvas that’s a swirl of many emotions. There aren’t a huge number of characters in this series, but Yokota-sensei handles the several who are here very well. It’s easy to connect with them, and I can only think of one character that I don’t really like (Hirari, but that’s just personal preference — I don’t think she’s poorly written or anything). My favorite character is shown early on and referenced regularly throughout the series, but is only properly introduced much later. 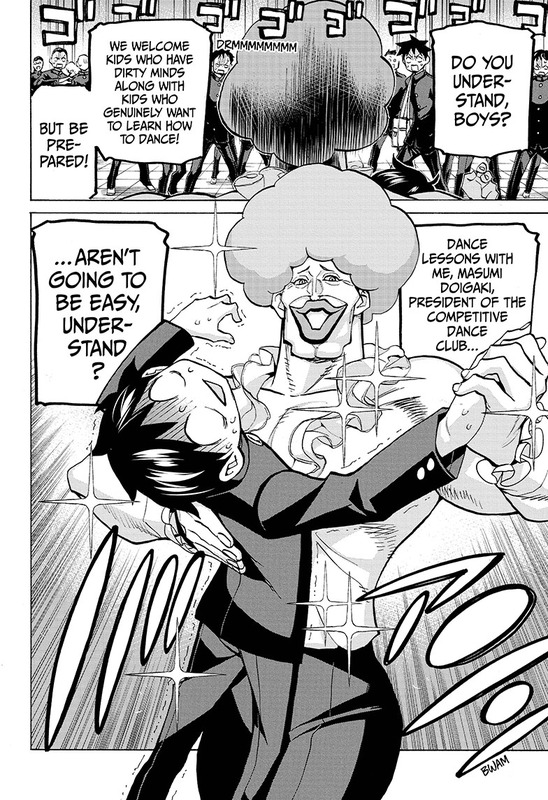 Sakimoto Jouji is heralded as the best high school dancer in the series, and yeah, he’s worth the wait. Won’t say anything about him other than I love characters like him. As we near the end of this article, I should also mention that I, at least, experience a sense of nostalgia from this manga. While I did do some dancing in a club at school, that isn’t why. Rather, I played in school bands and as a volunteer horn player in a band for almost my entire educational career (mostly trombone, euphonium for the volunteer band), which required me to go out and about to play at this or that event, travel occasionally a bit around the country to perform in other places, and generally hang with other musical dorks between performances. That atmosphere I felt in those days is clear in Straighten Up!, such that I get a really pleasant feeling from many of the scenes. The series is incredibly down to earth and relatable in that regard, and I quite love it for that. I can’t really think of another series I’ve read (or watched, for that matter — yeah, that includes Hibike! Euphonium) that gave me that feeling, so I really appreciate it. So, Sesuji is great and it’s great that it’s still going alive and decently strong in Weekly Shounen Jump (I really thought it was gonna die, and am happy it didn’t — hope it still doesn’t (spoke too soon: it did ;_; though it was a natural conclusion…I guess)). It’s also great that someone actually decided to keep translating it. Man, readers at today’s date (January 5th, 2017), look forward to the translated material to come — it’s phenomenal. Really, Yokota-sensei is doing a rather splendid job with this manga. There were a lot of ways it could’ve failed, but it works incredibly well. Now then, thank you for reading this day-late review. I overestimated my abilities and had to push this back a day. Hopefully that won’t be the case for the next series! Next time I’ll be going over another manga, but saying what it’s about would probably give it away immediately since there’s only two manga of its kind out and notable right now. So, uh…wait for that. Just finished marathoning everything that exists up to this point; I never thought I’d like a manga about ballroom dancing this much. I really do enjoy how all the characters are, if not fully positive, at least all characters one can enjoy and root for. “Author of Kurosawa” was enough to sell me on at least giving it a try, and I’m so glad I did. Thanks for recommending it! Gah, oops! Yeah, I even remembered that distinction when I started reading (and when I was recommending it to friends of mine who are Big Fans of Kurosawa). I think “anyone involved with Kurosawa” would’ve been sufficient to pique my interest regardless, haha. I did finish giving Grand Blue another shot, and I 100% loved it, so thanks for that as well! 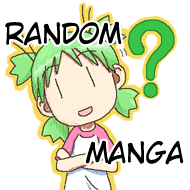 As a sidenote: every so often on reddit I run into someone saying like, “so what’s so amazing about Kaguya-sama” or some other such manga you’ve reviewed. My standard response is what *I* consider to be the super amazing things about it, and “if you want more detail, read [link to your review], since that’s a way better writeup than I could possible do.” Do you care if I tag your reddit username or not, since that gives you notifications and such? I generally default to doing so, but I worry about if you mind those sort of notifications. And I don’t mind at all, in fact I appreciate it. Thanks; do as you like! Starting my Marathon of this now, hope to see a review of Ballroom pop up sometime as well! It’s likely! Not likely soon, but it’s been in my backlog for a while.